I only have one full sized Essie polish in my collection, so I thought it was time to change that. Essie nail polish prices aren’t that cheap, so I searched around and found that Fragrance Direct stocked a fair few shades. I was so happy to see them selling for only £2.99! I know I couldn’t believe it either, so I picked up four shades to add to my collection! My first pick was the shade ‘I’m Addicted‘. A gorgeous bright blue shade that is so summer appropriate. This is the only one out of the bunch that I’ve already tried out. I had to apply about two coats to get this opaque, which is pretty good going. So far I’ve had it on for 4 days and there isn’t a single chip on any of my nails – result! The second shade I picked up was ‘Parka Perfect‘. Arguably a more autumnal shade but I do love a good grey toned nail polish. I did pick this not realising just how similar it is to Maximilian Strasse Her; which I already own. Doesn’t matter though, you can see they have a slight difference in tone to them. Thirdly, I picked up ‘A Cut Above‘. Can we just take a moment because ugh so pretty. This is a pink glitter which will look so lovely with some of the pink shades I already have in my collection. Finally I went for the shade ‘Fashion Playground‘. A very pretty pastel green shade which I’ve been after for the longest time. I do love a good pastel shade for the summer months and I think this is just perfect. Its quite a light shade though but hopefully it won’t take too many coats to get it looking opaque! 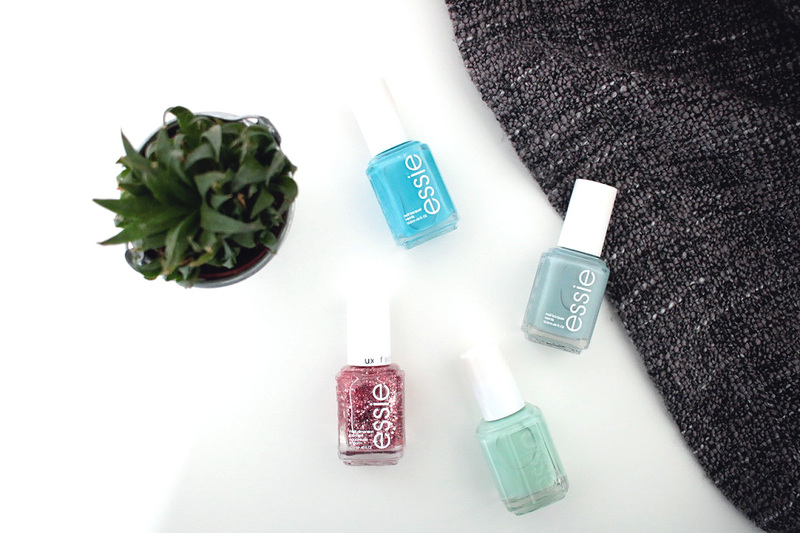 What are your favourite Essie nail polish shades?